The results are in, and they’re not pretty. The United States leads Western nations — all 30 of them — in ignorance about evolution. We have a higher percentage of citizens who don’t accept evolution than any other developed country does. Oh … except Turkey. The reason why these two countries are on top (or at the bottom, as the case may be) is that they have more fundamentalists than other countries. The only difference is that Turkey’s are Muslims and ours are Christians. It’s not the business of science to try to dissuade people from their religious beliefs. That’s one of many reasons why we don’t fund scientific initiatives to convert fundamentalists to accepting evolution. On the other hand, lots of fundamentalists spend time and effort trying to convince people that evolution is full of holes, and that anything connected with it is wrong — including the geologic timetable, radiometric dating, plate tectonic theory and the history of the Grand Canyon. This is not the domain of religion, and as most scientists know, the folks peddling anti-evolution are almost never real scientists. But the critical thing here is that anti-evolutionists don’t just proselytize their own flock; they reach out to those 50 percent of Americans who are untutored in and undecided about evolution. They sow just enough doubt to make people wonder whether evolution is more fiction than fact. And that carries over into the voting booth and into the schools. So scientists should learn how better to explain evolution and the rock record to those 50 percent of Americans in the middle. I don’t want to imply that every geologist should be visiting third-grade classrooms and discussing radiometric dating with the students. That wouldn’t be comfortable for most of us, or most of them. But we can support a strong geological curriculum by getting involved in state and local textbook adoption procedures and curriculum development. Those folks need good scientific advice, and we need to listen to them to see how we can best meet their needs. I’m actually going to suggest something even easier — something that most of us who teach in colleges and universities do all the time: improve the textbooks we use. In 2005, I served as an expert witness in the “intelligent design” trial in Dover, Pa. In reviewing for the judge the creationist “textbook” Of Pandas and People, I explained in some length — and in conversational language — the actual evidence for how birds evolved from dinosaurs, how whales evolved from land mammals, and how vertebrates came onto land, as well as the methods that we use to test our hypotheses. The judge and the reporters covering the trial were intrigued by this testimony and that of all of the expert witnesses. Most of what we know of the history of Earth and its life is not being taught to Americans — despite their desire to learn it. They’re not getting it in textbooks, not even the ones that focus on evolution and paleontology, as I found in a recent study. To get across what we know and how we know it, we need more illustrations like the one shown at left, which was developed for the Dover trial by Brian Swartz, a graduate student at the University of California at Berkeley. It shows the fossils themselves, so people can see the basis for our work. 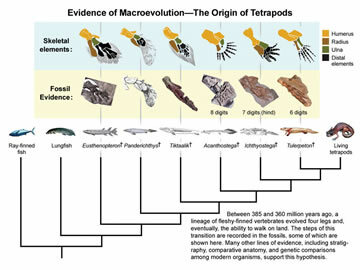 It shows the comparable parts of the skeletons color-coded, so the evolution of form is clear. It gives reconstructions of the animals in life. 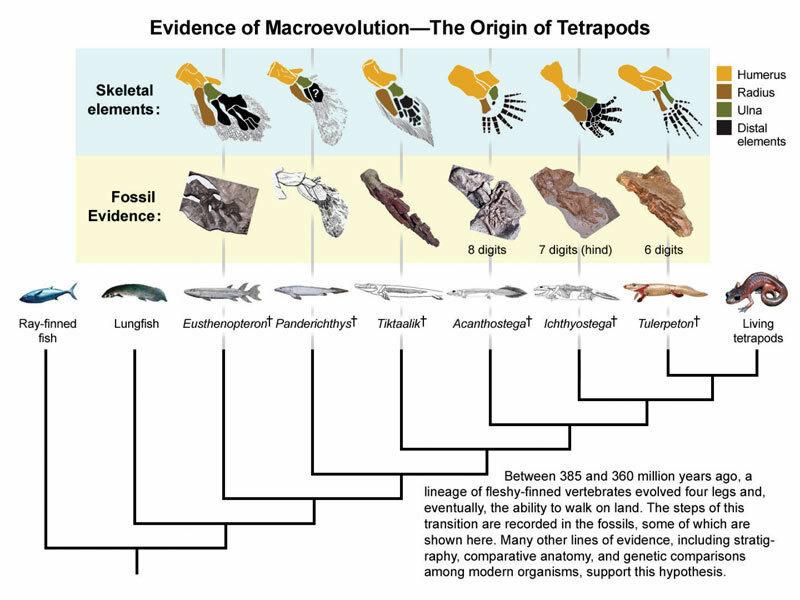 And it bases all this on an evolutionary tree that is derived from independent evidence. It illustrates what we practice: a highly integrative science that depends on the reconciliation of many independent lines of evidence. But the vast majority of the public is ignorant about this. So, if we want to improve general education on evolution, let's start with textbooks. We need to demand more and better coverage of these subjects. We’re the consumers, because we assign the books. We even review them and write them, or we know who does. Contact the writers or publishers and tell them that this is important. If we improve college-level books, the ones at K-12 will have to follow suit. Let’s fight the anti-evolutionists by putting the right evidence in front of the public and alleviating ignorance. Padian is a professor of Integrative Biology and curator in the Museum of Paleontology at the University of California at Berkeley, and president of the National Center for Science Education.